What Do You Mean I Can't Be the Pope? At some point in grade school, I finally realized I didn't have a snowball's chance in hell of becoming the first woman pope. Then again, I'd also been slow in noticing I couldn't even be an altar boy. Perhaps that turned out to be not such a bad thing, but at the time it felt unfair. Why boys only? What was so special about them? I so wanted to be clothed in magnificent vestments one day, head bowed to receive the Papal Crown. And of course, I'd be fluent in Latin. At church on Sundays, I'd imagine myself gloriously robed, standing at the altar, cloaked in incense. The tiniest whiff of its burning fragrance still summons vestiges of my religious upbringing. Even after my papal dreams were shattered, I remained mystified by the pageantry, the drama, and the majesty of the Holy Roman Catholic Church. Simply saying those four words made me feel transported. I was enthralled by the stories of the lives of our brave and tragic saints and martyrs. I, too, wanted to be resolute and heroic and leave a big mark on the world. No one would ever have guessed that one day I would manage something of a lasting mark, but it most definitely wasn't in the category of saint or martyr. As a young child I'd breathlessly awaited my chance to begin attending catechism, where I'd learn about sin and how to avoid it. The Ten Commandments, the categories of sins and their implications, and Church rules would be taught to us to help guide us in life. Then, in my little white dress and veil, I'd march down the center aisle in church and receive my First Communion. I would be absolved of my sins, Catholic ground zero. It came fast. We received First Communion around the age of seven, at which point we were supposedly able to reason clearly and therefore reliably exercise our free will to avoid sin. My younger sister, Mary Beth, who is now the nurse in the family, insists that studies demonstrate today's youth aren't fully capable of understanding the consequences of their actions, religious or otherwise, until their early twenties. Ages ago, we were expected to get on with it at seven. Now they can't manage until they reach drinking age? Would that mean they shouldn't have their First Communion until reaching twenty-one? In any case, and unfortunately for my seven-year-old head, catechism had its downside. I was a quiet kid with a tendency to fear authority. It didn't come from my parents, Ruth and John. Disinclined to exact punishment, they were also very bad at "no." But once I'd begun catechism, life smacked of "no." Almost everything in my world seemed to be a sin or to threaten one. Sometimes the simple act of living felt like running temptation's gauntlet, as if hydra-headed demons of evil were waiting at every turn, trying to lead me sinfully astray. If Mom corrected me for some minor wrongdoing, like trying to beat up my younger siblings, I worried I was earning a one-way ticket to hell. With catechism's emphasis on sin rather than the compassion and forgiveness of Jesus, avoiding the inferno sometimes felt impossibly beyond my reach. Fear trumped reason, and I lived with it for years. I prayed every night before bed. There was the standard "Now I lay me down to sleep ..." and then you could mention your specific issues to God. I always prayed hard for a miracle so my older brother, Steve, would become able to hear. I added my own little pleas to the multitudinous ones of my parents, who'd been praying for the same thing almost from the day of his birth. My dad stopped by church every day for solitude and consolation. Although at some point Mom gave up praying for the Steve miracle-her knees raw from novenas on his behalf-Saint Jude, the patron saint of lost causes, remains her primary saint. At some point in the lives of all five of her offspring, each of us either became or threatened to become the particular lost cause Mom prayed to save. While no patron of her saints, these days I am convinced my mother has powerful energy that she prays into her universe. When I need a little extra protection or strength, I get Mom on the phone and ask for her prayers to Saint Jude. It makes both of us feel better. Also, from time to time-and even though we've had amusing debates about religion-I fire off an email to Desmond Tutu and ask for his prayerful support, too. So far he hasn't turned me down. Perhaps surprisingly, these days I find satisfaction in contemplating Ganesh, the elephant-headed Hindu god. He is revered as a remover of obstacles, an attribute that seems to parallel Jude's intervention on behalf of lost causes. Ganesh makes me smile, in contrast to my unhappy recollections of sin and Catholic hellfire. But when I was a kid, even the dashing of my papal hopes didn't alter the fact that being Catholic was a central element of my life. I came by it naturally. My grandmother, Marianna Bertolino, whose name was ultimately shortened to Anna or Ann after she came to America, was born in Italy. At the beginning of the 1900s, when she was about a year old, her parents left that seat of the Church's power for the tiny village of Poultney, Vermont. It didn't matter that years later my grandmother married my grandfather, Ralph Colvin, a self-proclaimed heathen. To get her hand, Ralph had to solemnly agree that any offspring would be raised Catholic. The same promise was required of any of the other heathens who wanted to marry my grandmother's seven sisters: it was the Catholic way or no way. Therefore, my mother, Ruth, and her younger brother, Chuck, were raised in the Church. As was I and my two brothers and two sisters. It didn't matter that my father's side of the family, who we almost never saw in any case, was Scottish-Welsh Presbyterian. Despite the small percentage of our blood that is Italian, we kids all cleaved to that heritage and its religion. Ralph and Anna B. Colvin were my "real" grandparents. Dad's parents didn't figure hardly at all in our family equation. He didn't particularly like them himself. My father, John Clarence Williams, was drop-dead gorgeous. I have a picture of him at around age eighteen, and to my eyes he's virtually smoldering from beneath its sepia tint. To me he smacks of James Dean. When fifteen-year-old Ruth Colvin first saw him, her heart did a triple somersault, and it never stopped. She's related the story a million jillion times, but it always feels fresh in her telling. "Jody," she says, seeing her past through luminous eyes. "When I first saw John, he was just home from World War II, walking downtown in his navy whites. He was so handsome I ran myself ragged trying to 'casually' appear in his line of sight no matter where he was." She bounces around the living room in imitation of her teenage self trying to nonchalantly chase down my father. Throughout their fifty-eight years together, anytime Mom saw my father unexpectedly, she got butterflies in her stomach. "Just like the very first time I saw him," she says. Two months after they met, Dad asked my grandfather for permission to give Mom an engagement ring for her sixteenth birthday. Uninspired at the thought, and predictably, Ralph said flat-out no. He wasn't mean about it, but he said there'd be plenty of time for that once his daughter finished college. And, he pointed out, she wasn't even out of high school yet. No fool, my father knew if Ruth went to college unattached, it would spell their end. Not long after my grandfather quashed the engagement hopes, my parents went to New York-easy because you can spit into New York State from Poultney-lied about my mom's age, and got themselves married by a justice of the peace. Later that evening, after the stark little ceremony, Dad dropped Mom off at her house and went back to his own place. They supposedly envisioned carrying on as before and keeping their marriage a secret indefinitely. Ridiculous. In any case, some months later, Mom noticed that her period was late. She tried jumping rope, hard, to make it start. It didn't, and soon the impending need to tell her parents that she might be pregnant ended that delusion. Stephen John Williams wasn't part of any official strategy of outing the secret marriage, at least not that I know of. But some years ago I began to wonder if the thought hadn't been playing around somewhere in my dad's subconscious. Despite the shock, there were no recriminations in the Colvin household-you stand with family. And much like I do, my grandfather tended to make more noise at life's more inconsequential irritants. With things that really mattered, he was straight, calm, and solid. After the requisite Catholic marriage ceremony to sanctify the union, Dad moved into my grandparents' home, carrying all his belongings in one brown paper bag. My grandparents and Mom's younger brother, Chuck, fully embraced my dad, and they became the loving family he'd always dreamed about. Steve came howling into the world about six months later. Mom's undetected German measles during her pregnancy had left my brother stone deaf. His vocal cords worked, but Steve would never accurately pronounce words he couldn't hear. His ability to scream was unmatched, however. Four decades after his birth, sometimes it didn't feel all that different, although that was for very different reasons. And still it took more years before proper medication was prescribed that finally began to help him. Even if my parents had known Mom had measles and considered the possible impact on a fetus, the course of their history wouldn't have changed. Their fate had been sealed from the moment Ruth Colvin first set eyes on John Williams in downtown Poultney in 1946. Notwithstanding their difficult first child. Steve was the kind of night crier who makes all young parents want to scream themselves. He rarely granted a night of uninterrupted sleep. In those days, my father was earning twenty dollars a week shoveling coal. He left home early in the morning and came back late at night covered in coal dust. Mom says my six-foot-tall father's weight dropped to 137 pounds in those days. He looked like a scarecrow dusted in black, a far cry from the dashing navy man she'd drooled over. Always exhausted, my father could fall asleep instantly. But even Dad couldn't sleep through Steve's screaming, and he'd take his turn walking his son around the dark bedroom trying to lull him to sleep. What my grandparents and Chuck did to block it all out, I do not know. After about a year and a half of interminable crying, Steve began to calm down. Life was finally finding balance when Mom began her campaign for another baby. It seems insane. All I can imagine is that the screaming had something in common with giving birth-it was like the horrible pain that mothers soon forget or they'd never want another child. Apparently, once Steve was sleeping consistently, Mom forgot the tension and distress of eighteen months spent with a shrieking baby. My dad didn't share the enthusiasm. After growing up extremely poor with seven siblings during the Great Depression, he was frightened and oppressed by the thought of a large family. He worried constantly about how he'd ever be able to give his family all the things he'd never had as a child. My parents and Steve were still living with my grandparents. But Mom was relentless in pursuit of her objective. I was born two months after Steve turned three. By then they'd managed to move to a second-floor apartment in a house directly across the narrow street from my grandparents. When hugely pregnant with me, Mom gained fifty pounds, and she'd sit in the window of the apartment weeping as she stared longingly at her home. No one knew it then, but all that crying presaged worse things to come with another move. Mom wept not only for the loss of her life as it had been but also for how it might have been, despite her passionate love for my father and her continuing desire for more kids. By the time she was twenty-three, my mother had four children. Mark was the youngest of them; then Mary Beth, who is eighteen months older than him; then me, twenty months older than Mary Beth; and Steve, three years older than I am. The youngest in our family is Janet, who wasn't born until after the trauma of our move to Brattleboro, a town two hours from Poultney. She's almost nine years younger than I am. In my mother's place, with all those kids, I'd have gone stark raving mad. Her nervous breakdown would have looked mild by comparison. By the time I was thirteen, I knew I wasn't cut out for parenting. I'd felt it almost from the first time I performed the adolescent-girl job of babysitting, for the princely sum of fifty cents an hour. As soon as the door would close behind the happy parents going out for the evening, I'd feel trapped and desperate. It was as if all the air had been sucked out of me. A couple of hours later, at the sound of the parents' key in the door, I would feel an almost palpable sense of liberation. And I would be close to euphoric when I could leave. I knew then, on the cusp of abandoning my short-lived babysitting career, that motherhood and I would never ever be a good fit. It was demonstrated again when I was an adult. When I was in my early forties, I made a gift of myself to my sister Janet and her husband, Dan, and also to Mary Beth and her husband, Paul. I offered each couple a week of free babysitting so they could go off on adult vacations. I stayed with Janet's kids first. Riley was a baby and his sister, Devan, was just walking. The next week, it was Emma, also a baby, and her sister, Libby, who was about four. Even though they are my nieces and nephew and I love them like crazy, they drove me crazy. I felt exactly the way I had when babysitting in my youth. It may be hard for most people to understand, but two weeks with kids almost did me in. Creating the landmine campaign was less fraught with stress than trying to be a stand-in parent. Mom had to come and spell me from time to time over those two weeks, and she laughed at me every time she did. When the last day of my ordeal finally arrived, as Mary Beth and Paul pulled into their driveway, I was already standing in the door, bottle of champagne in my hand (for myself, to celebrate my liberation) and ready to flee. They, too, laughed at me. Occasionally, and despite that experience, Mom still tries to tell me how different it would have been if I'd had my own. She'll always believe that if I'd had kids, I would have "loved it." "Just look at how you are with your animals," she insists. "Imagine if they were your children." The fact is, I've never understood why she'd had four of us almost in a row when she was still practically a kid herself, or why she'd still wanted more. My father never tried to sell me on having children. He loved all of us every bit as much as my mom did; but given his experiences as a child, he empathized with my desire not to have kids. My father's mother, Jean Buchanan, was an immigrant like my Italian great-grandparents. She'd arrived in America from Scotland at the age of seventeen, quite a looker and with some money in her purse. My dad said both details were true. I never saw any photographic evidence of the former; the woman I knew was hard, cold, and bitter. Any traces of beauty were long gone, if they'd ever been there in the first place. Perpetually squinting through a haze of cigarette smoke, Jean uttered harsh commentary in a harsh brogue. She was always complaining about her lot in life or one or another of her eight children. I never met Dad's father. He lived with his second wife only a few miles away in another village, but he never cared enough to meet us. By the time Jean married Roy Williams, she had blown through whatever money she'd brought to America. I remain ignorant of how they met and why they married. When I think of Jean, in particular, and Roy, from how my parents described him, I can easily imagine them as unsympathetic and broken characters from the Grapes of Wrath. Roy and Jean scraped by while Roy managed a run-down farm in the town of Hampton, New York, which is across the bridge from Poultney. While our village had a population of twelve hundred people, the only thing that marked Hampton was a grocery store by the side of the road that ran north through the state to the Canadian border. Hampton was a town that wasn't. My father was born in an old bed in the sad old rented farmhouse in a town that existed only as lines on a map. My mother says that Jean was a sharp and unloving mother. The words "I love you" did not pass her lips, and she never held or hugged her kids. When my father reached ninth grade, Jean made him quit school and go to work to help support his seven younger siblings. She required that of all her children, each in turn. Before the others were old enough to help, my dad was the one who had to collect water from the farm's well every day for the family's needs. My father didn't live in a place with electricity, indoor plumbing, or bathrooms until he was seventeen years old, which was when he joined the navy, with his mother's permission. Until then, he'd always used an outhouse. I didn't know this until after he died in 2004, because he had been too ashamed to talk about it. It wasn't until then that his weird jokes about chamber pots, which he referred to as "piss pots," made any sense to me at all. When they first got married, Dad told my mom that he would never, ever go camping. Not that I can imagine for a second my mother ever wanting to either. It isn't her style. He said that he'd camped out the first seventeen years of his life and he'd never do it again. My father was a kid when he developed his deep-in-the-gut hatred of inequality. In part it manifested itself through his profound dislike of the Republican Party, a dislike born in the grocery store in Hampton. He had the humiliating chore of going there to pick up the Depression-era support checks that helped the family survive. The store's owner and his sons happened to be Republicans; they also happened to be men who abused the system and took a cut of families' support checks for "administering" the relief money. Those who dared to complain found even less money in their hands the next time. If they complained too much, there might be no money at all. And not only were those desperate families stolen from, they were treated like dirt in the process. For my dad, these men epitomized greed, corruption, and-maybe the worst thing in his estimation-a complete lack of regard for the common man. Or as he put it, the "little guy." For his entire life, that family rode the waves of my father's psyche like wraiths. Whenever any of us accomplished something grand, something unexpected, he'd wish he could transport himself back in time and stride into their long-closed store, puff out his chest, and brag like mad. He'd show them. How could he possibly be trash if his family could do such great things? Imagine when I received the Nobel Peace Prize. A few years after Mom and Dad were married, they managed to buy a grocery store in Poultney from one of Mom's Italian aunts and her husband, who'd taught Dad to be a butcher in the store. As soon as it was his, my father defiantly hung Democratic Party posters in its two big windows, which faced directly onto Main Street. When Roy saw the posters, he rushed into the store and tried to take them down, fearful that people would no longer shop there. All those in Poultney who mattered, and most of those who didn't, were Republican in those days. Dad turned on his father. He didn't give a damn if no one shopped there. He was a Democrat, and he wasn't going to hide his beliefs from anyone. He didn't care what anyone thought. The signs stayed put. And no one stopped buying their food at my father's grocery store. I inherited that attitude from my father and from my grandfather Ralph. When I was younger I didn't realize, or couldn't acknowledge, that it had come from both of them. As I grew up, I increasingly identified with my Grampa Ralph. He was strong, confident, and didn't suffer fools lightly. He laughed as easily and quickly as he angered. Once the anger passed, also quickly, he didn't think about it again. I have Ralph's jaw and my dad's blue eyes. I didn't understand how much I identify with my father's lifelong concern for the everyman. Part of that is what helped shape me into the grassroots activist that I am today. That, and trying to protect my brother. From her modest beginnings to becoming the tenth woman—and third American woman—to receive the Nobel Peace Prize, Jody Williams takes the reader through the ups and downs of her tumultuous and remarkable life. In a voice that is at once candid, straightforward, and intimate, Williams describes her Catholic roots, her first step on a long road to standing up to bullies with the defense of her deaf brother Stephen, her transformation from good girl to college hippie at the University of Vermont, and her protest of the war in Vietnam. She relates how, in 1981, she began her lifelong dedication to global activism as she battled to stop the U.S.-backed war in El Salvador. Throughout the memoir, Williams underlines her belief that an “average woman”—through perseverance, courage and imagination—can make something extraordinary happen. She tells how, when asked if she’d start a campaign to ban and clear anti-personnel mines, she took up the challenge, and the International Campaign to Ban Landmines (ICBL) was born. Her engrossing account of the genesis and evolution of the campaign, culminating in 1997 with the Nobel Peace Prize, vividly demonstrates how one woman’s commitment to freedom, self-determination, and human rights can have a profound impact on people all over the globe. Jody Williams, who received the 1997 Nobel Peace Prize for her work to ban landmines, is founding chair of the Nobel Women’s Initiative, launched in January 2006. She is the recipient of fifteen honorary degrees, and in 2004 Forbes magazine named her one of the hundred most powerful women in the world in its first such list. Since 1998 she has served as a Campaign Ambassador for the International Campaign to Ban Landmines, which she helped found in 1992. Williams holds the Sam and Cele Keeper Endowed Professorship in Peace and Social Justice at the Graduate College of Social Work at the University of Houston. In 2012–13, she became the inaugural Jane Addams Distinguished Visiting Fellow in Social Justice at the University of Illinois at Chicago. 1. What Do You Mean I Can’t Be the Pope? 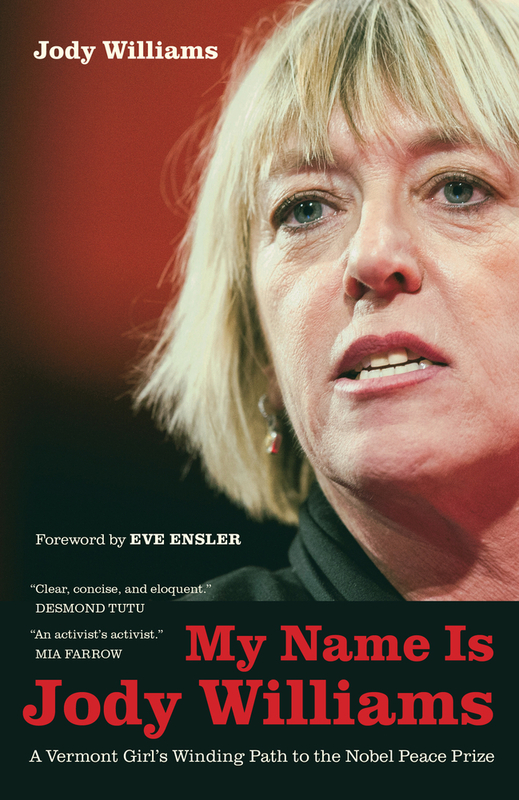 Watch Jody Williams read from her book at Phoenix Books. Nobel Peace laureate Jody Williams' TED talk on what "peace" really means and why action is needed when prayer and meditation fall short.